The Vertu Ti has been officially uncovered as the first Android smartphone from the luxury brand and it sports a price tag which will leave you feeling light-headed. Vertu is renowned for its garish, over-priced devices. Although it parted company with Nokia and the Symbian platform last year, this hasn't stopped the maverick firm from doing what it does best. On paper the Vertu Ti is just another mid-range Android handset with a 1.7GHz dual-core processor, 3.7-inch display, 8MP camera, NFC, 1250mAh battery and the now dated Ice Cream Sandwich OS making it seemingly destined for mobile obscurity. However, lock eyes on the Ti and you'll notice that this is a phone which wants to stand out from the crowd, with its polished Titanium and leather-clad chassis appealing to only the most refined palate - and then there's the cost. It comes in at £6,700 (around $10,600/AU$10,300). No, we haven't accidentally added extra zeros, the Ti really will set you back the same amount as a small car - and that's just the starting price. Fancy picking up the Black PVD Titanium Red Gold Mixed Metals version? It's £13,900 (around $18,600/AU$18,100). Included in the price is access to Vertu's concierge service as well as Vertu Certainty, which is a security system ensuring all data on the device and its user is safe. 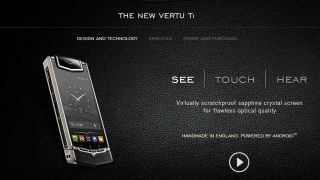 The Vertu Ti release date is set for this month and it will be available in over 500 stores around the world.